Back when I was living in Houston (circa 2011), I was introduced to Morgan Carper’s designs by my friend Brittany and fell for her pieces instantly. We had both launched our unique businesses (I had just started the blog, she had just launched her first collection), so it was the perfect time for us to meet! Her fabulous prints and attention to detail are immaculate, not to mention totally wearable, so you can imagine why I was so impressed. This spring, Morgan reached out hoping to send me something from her latest collection to style on the blog, and I didn’t hesitate for a second after I saw the Kismet jacket. The black and marled gray stripes, easy fit and drawstring waist called out to me. I got it in the mail last week and have worn it three times already! This jacket is a great travel piece because it doesn’t wrinkle, and it’s fun to style a bunch of different ways. Wear it open with a tank and shorts, or tighten the drawstring for a bit of a peplum effect over a dress – plus, who can say no to some waist-cinching action? It’s incredibly comfortable and practical – great for transitioning to spring and fall! Be sure to check out Morgan Carper’s entire spring/summer collection, and peruse her lookbook for fall. You don’t want to miss it! LOVE your bag. Such a chic color combo. This jacket is awesome, such a great piece. Love this jacket on you and those sunglasses as well! 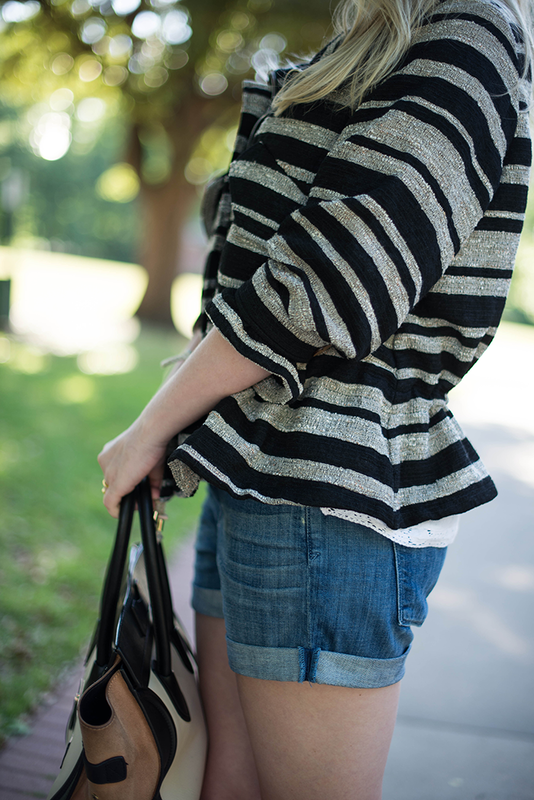 Such a great look – I love the neutral stripes & easy shape of this jacket! 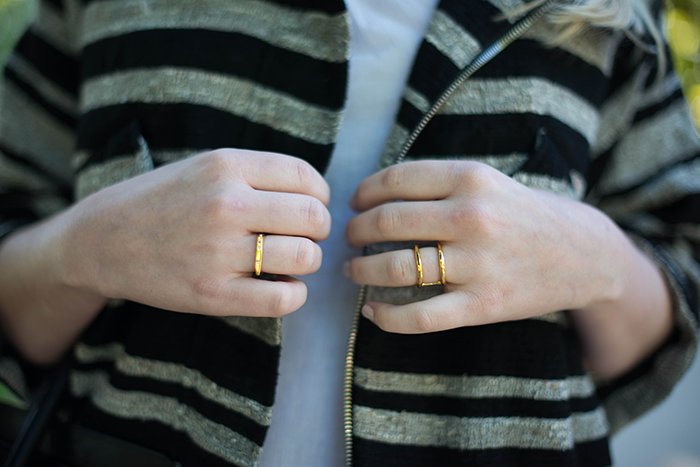 that jacket is amazing, and I love your rings. Looking fabulous as always! Oh I’m a big fan of stripes so I love this jacket! Off to go check out more of her designs now! Love how the jacket matches your purse! The jacket is pretty fabulous and looks so versatile! Thank you for the introduction, how cool that you both started your businesses at the same time! Loving the shape of that jacket :) Ps totally jealous of your trip to mexico that I was stalking on instagram, looks like a fantastic time! Such a great jacket! I am all about the waist-cinching action, and who doesn’t love something that can be dressed up and dressed down so easily. Love how you styled it! Dying over this jacket! So versatile and effortless. 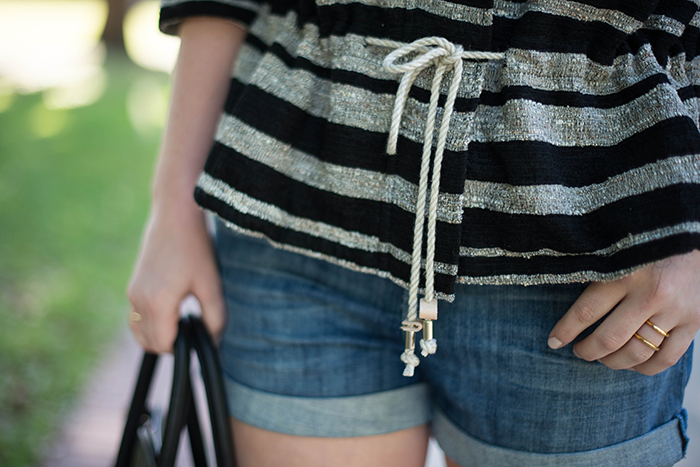 Plus, the combo of stripes and the drawstring waist is a win win in my book! Perfectly styled! That jacket is a great piece! I love the way you dressed it down. Those sunglasses are great also! I love the jacket – whole outfit is perfect! Ah the stripes on that jacket. So fresh and natural! Love the whole look! Gorgeous look, Merritt! Love the Newbury booties… That cognac color is perfect.I have them in black and brown, but I wish my brown ones were lighter like yours. Such a great, casual outfit. I love your style so much! Happy Cinco de Mayo! Love the booties with this look! I just love that jacket! And your bag matches so perfectly! 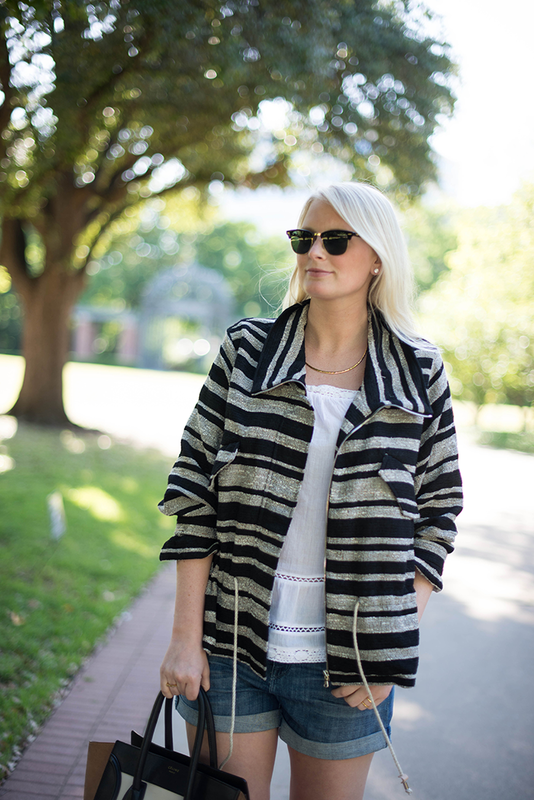 LOVE that jacket – so perfect for warm summer days and ‘cooler’ nights! Such great shape to the bag! I seriously never get tired of seeing that Celine. Great jacket and love this casual but put together look on you! Love that jacket! 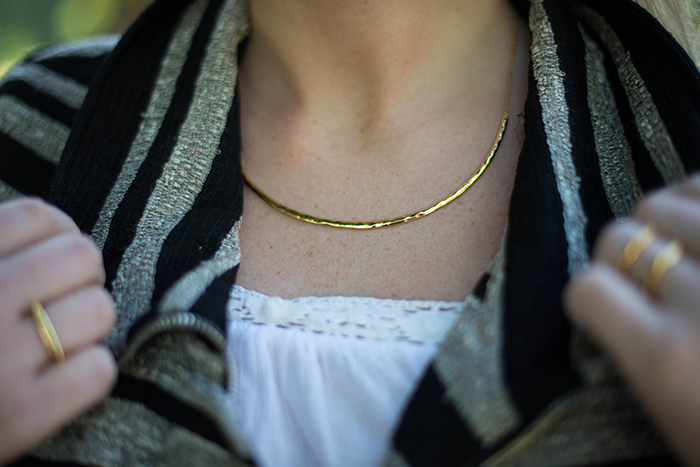 Such a great, versatile piece! Ah. You look wonderful, as always! Love that jacket! That is a beautiful jacket and it’s different. I would love to purchase a similar one because I always have the same styles in my wardrobe. This jacket…is literally everything!! I can already think of 100 ways to wear it and I think you paired it perfectly for this time of year. Can’t wait to check out her site for other pieces! Such a fantastic look! That jacket is amazing! BTW, I have a new domain…www.stylefragment.comCute outfit, love the jacket. Love the outfit, especially the jacket. I love it all. I want that oufit on my body asap. So cute and cozy! 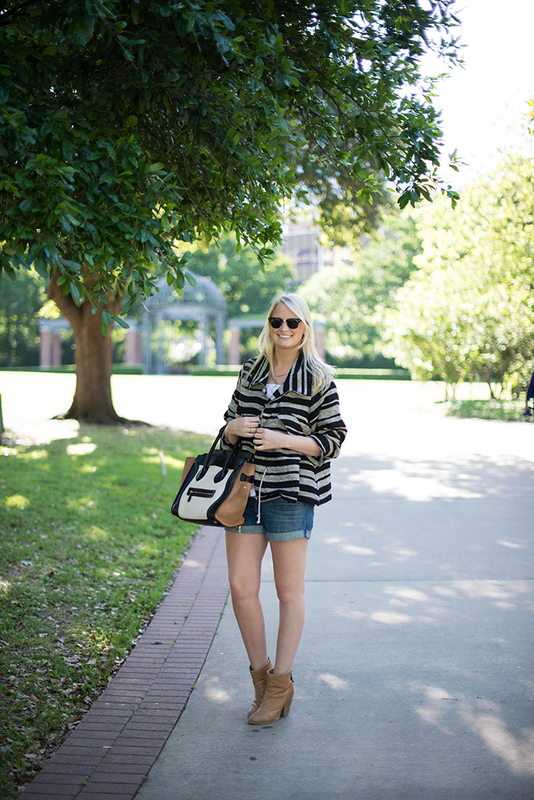 Love the Morgan Carper line and that jacket looks really great on you! Oh wow. That jacket. THAT JACKET!